A couple of weeks ago Jules and I drove to our favorite park. We have to drive a little farther for this particular park, we pass closer parks on our way, but we go to this one because of the Swing. This park has an adaptive swing Julia loves, so the extra minutes to get there are more than worth it. As we were parking on this particular visit, I noticed someone was in the Swing, which is somewhat rare. I was excited to see it was being used! We approached and saw a little girl maybe 4 years old in the Swing being pushed by her 19 or 20 year old nanny. The little girl was having a great time, laughing and smiling. And why not? 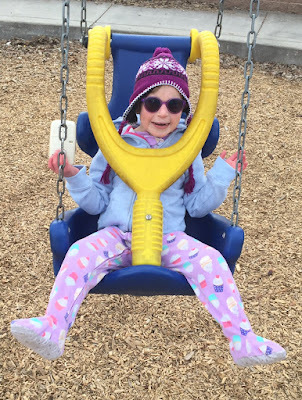 The Swing is super fun - not just for kids with special needs, it's a fun swing for all kids! When the nanny saw us walk up she instantly stopped pushing the girl and told her she needed to get off the Swing. The little girl was in tears. "No, no, no," I said to the nanny. "She can keep swinging, we can wait our turn!" The nanny looked hesitant, like maybe she should not accept my offer, but I reassured her we could wait, so she said to the little girl "You get two more minutes then we need to share." At this point I am thrilled. This is what kids do on the playground right? They take turns. They share. They learn to wait. Such great stuff for Jules to experience! Two minutes passed and the little girl finished her turn swinging. We thanked her for sharing with us then she ran off to play elsewhere. I put Jules in the swing and she proceeded to crack herself up each time I gave her a big push, her laugh echoing across the playground. And I felt like I was on cloud nine: Sunshine and swings and kids and sharing and laughter - all was right with the world. After about 10 minutes I told Jules she needed to get out of the Swing and give other kids a chance to use it. There were no kids waiting for the Swing at that point but I felt like we should take a break just in case someone wanted to use it. That's a good mom move, right? It took less than a minute for the original little girl to run back over to the now empty Swing and proclaim loudly that she wanted another turn. I was smiling at her, thinking "Yes, of course, now it's your turn!" But this time her nanny told her no. This swing was not for her, the nanny explained, she could do something else instead. The little girl protested, and silently I protested too, but the nanny picked her up and carried her away to another part of the park without further discussion. My heart sunk. I wanted the little girl to come back and swing on the Swing, the Swing she thought was so fun, the Swing that in my mind was not just for Jules but was also for her. A few minutes later while Jules was still playing in the wood chips, another little girl ran to the Swing and started trying to climb in. Her mom quickly walked over and sternly said "That one is not for you, it's for other kids, it is not a toy for you to play with." And without looking at us the mom took hold of her daughter's hand and walked her to another part of the playground, leaving us alone with our Swing. And my heart sunk a little deeper. I felt like shouting to the whole playground, "Friends, come back! Please, come back by us, play near us, share this fun Swing with us, and keep thinking of this whole place as being for all of us!" But I stayed quiet. And here is the thing - I KNOW, I KNOW, I KNOW that both the nanny and the mom were totally trying to do what they thought was right regarding the Swing. I know they were thinking that because we were there they were supposed to let us have it. I know that. And I know their actions were coming from good intentions and I appreciate them trying to be so considerate - I really, really do. It just hit me that in their efforts to be considerate they were sending the wrong message about the person they were trying to be considerate of. And those little girls heard that being considerate to Julia meant to move away from and separate from her. And that makes me sad. I started to wonder, if kids are told the Swing is not for them but for others, what do they then think about the kids they see in the Swing? If we tell kids the Swing is different and off limits are we accidentally telling them that the kids who use the Swing are different and off limits? Every time we scoop our kids up and move them away from another person what are we telling them about that person? I don't want this to come off as another, "Hey everyone out there, do this differently when you are around people with special needs." I know that gets old. I know most people are trying super hard to get it right, whatever right is. Honestly, I just saw this as an opportunity to think about our messaging to kids, because it struck me so clearly as I watched those interactions play out that what an adult meant to be a message about consideration could so easily be interpreted by a kid as a message about segregation. So maybe if we can just try to watch this little thing, this little part of our communication, this subtle message to our kids that different is something to distance from rather than something to move towards, if we can shift from "them not you," to "all of us," maybe, just maybe we can change the ways of world. Yes, one step towards each other at a time, we can change the world. Thank you for this article! We have a swing like this at our local park, and my girls LOVE it too! Thank you for this! I would have reacted the same as the other moms thinking it's like the handicapped bathroom/seats on the subway, to be left open for those who need it. I see now that recreational stuff or shared toys are a totally different thing! It is so hard for parents to know what to do because we all see it from different standpoints. Other parents of a child with special needs may not be at all happy that the swing was being shared by all kids. It could be seen as the one piece of playground equipment their child could enjoy. Very true - I still think there is an opportunity for different messaging that helps typical kids feel more comfortable around kids with special needs. When my daughter was smaller, she loved the Swing. She was able to use the "regular" swings as well, however. In the case where there were open "regular" swings I would have probably suggested that she let Jules have the Swing and hop on the "regular" swing next to her so they could both swing together! All playing together is the main point for sure! Thanks so much! I'm glad it made sense. :) And I think you are right - maybe next time I'll do more to express that the kids are welcome to stick around and share! Thanks! We have one at our park and at our middle school in our Special Educators room! Well I also have one a little different in my Learning center (reasource) teachers room, my friend and I love it, as do a few of our friends who are both neurotypical and atypical like most of my friends and myself! I'd've moved my kid away from that swing too - my kid can play on ALL of the playground equipment, your girl can ONLY play on that swing. It's only courtesy. It would be ideal if all the the swings looked alike and were accessible to all children. Why do the swings need to look different if one swing will fit all kids? Cost may be a factor, but I can't think of a better investment, i.e., inclusion for all. It would be one step in the right direction. In inclusions purest form of definition it should mean offering something that will work for everyone. Everyone. Great post. I enjoyed it. That's such a good point! Thank you! Great post. I think kind souls are worried about offending parents of kids with disabilities. I'm glad that the people at the park were aware of the need for Julia to have access to the Swing. Some people, sadly don't care or think, and wouldn't advise their children to take turns with the Swing. Even though there are children with special needs waiting, and there are plenty of other swings to use. Thanks Tiffany - totally agree, these moms were absolutely trying to do what they thought was right!